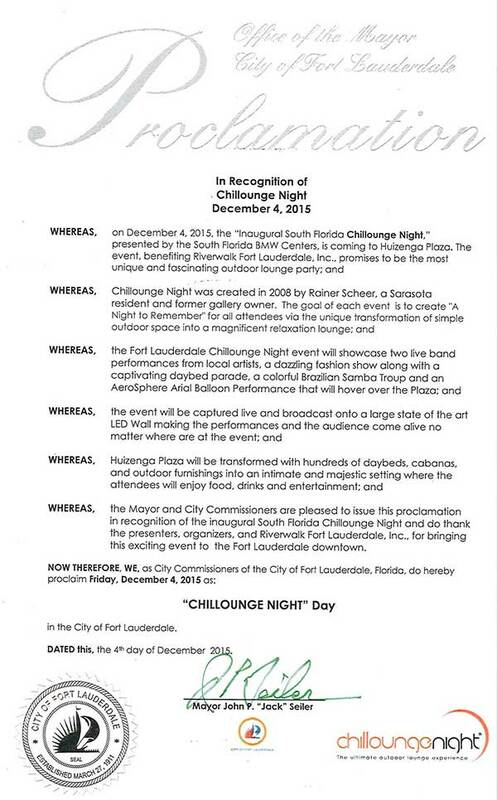 In recognition of Chillounge Night December 4, 2015, to be held at Huizenga Plaza in Fort Lauderdale, the Mayor and City Commissioners of the City of Fort Lauderdale issued a proclamation recognizing the Inaugural South Florida Chillounge Night, presented by the South Florida BMW Centers, as promising to be the most unique and fascinating outdoor lounge party. The Mayor and City Commissioners further thanked the presenters, organizers, and Riverwalk Fort Lauderdale (our host and benefiting charity) for bringing this exciting event to Fort Lauderdale. Selby Gardens may not seem like your typical nightlife location, but on March 27th, you will see the gardens in a whole new light. Sarasota Chillounge Night is back for its 8th year and the “Cirque du Chill” experience that Rainer Scheer has planned for you will be unlike any night on the town you’ve ever had before. Scheer’s event coordination goes far beyond just choosing the location, hiring the entertainment and selecting all of the details to create the perfect outdoor nightlife ambiance. He and his team have worked cooperatively with the city engineers and sought out the necessary insurance for the numerous awe-inspiring acts that will be performed at this year’s Chillounge Night “Cirque du Chill” event. 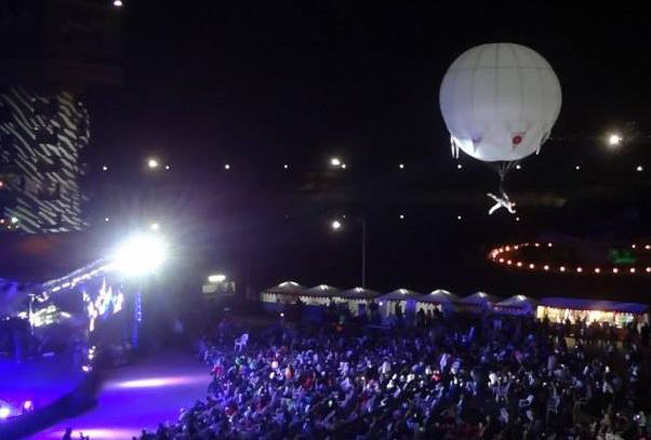 That, of course, includes the AeroSphere Aerial Balloon Show, where an acrobat will be performing while suspended from a helium-filled balloon. “This will surely be a night to remember,” says Scheer. “My guests [from the St. Petersburg] told me that it’s like Cirque du Soleil but interactive and under the stars.” This year’s Chillounge Night event will transform Selby Gardens into an interactive feast for all of your senses, with intriguing circus arts performances, a fashion show by local boutique owner Ana Molinari, delicious food, and premium drinks. In the spirit of promoting community involvement, a majority of the event sponsors are local businesses, including BMW of Sarasota, MarineMax and Café L’Europe. For musical thrills, The Black Honkeys, the three-time winner of Creative Loafing’s Best Band in Tampa, will be performing as well. Scheer will have live coverage of the event broadcasting on three LED screens throughout the Gardens, so no matter where guests are located, they won’t miss out on the spectacles. And you never know what may happen. “We’ve had guests propose and get engaged on stage, and then return in following years to celebrate their anniversary,” says Scheer. But you certainly don’t have to get engaged to consider Chillounge Night a memorable evening – just come out and see for yourself! And where better to chill than the aptly named Chillounge Night, Sarasota’s swanky annual block party? 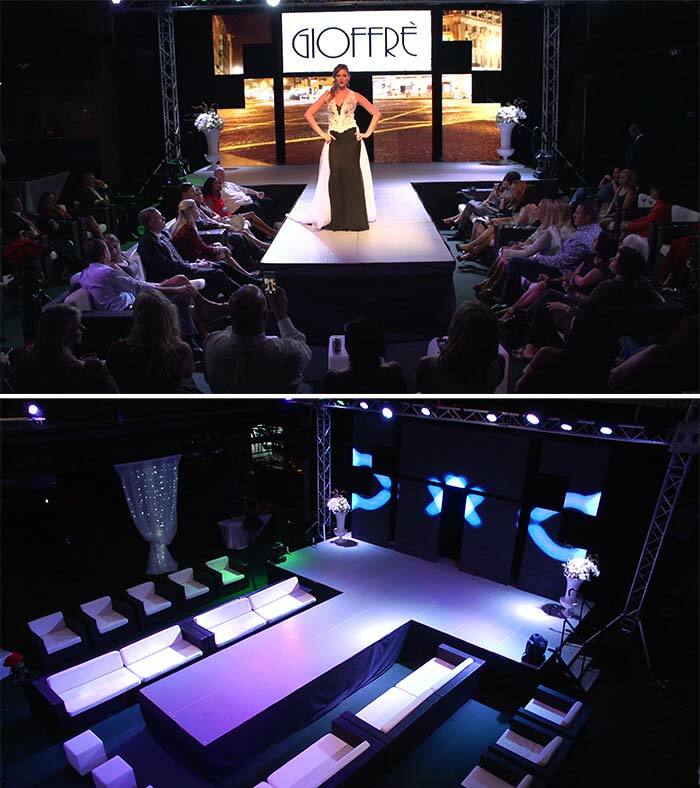 Since 2008, Sarasotans have come to know and love the event, which takes over downtown each spring (and Westfield Southgate Mall, last year) with festivities including upscale lounge furniture, food, drink, fashion shows, live music and more. This year, Chillounge has teamed up with the Circus Arts Conservatory and Nock Productions to create something completely different. Dubbed “Cirque du Chill,” this year’s event, which takes place at 7 p.m. this Saturday, at Marie Selby Botanical Gardens, will feature an all-new circus theme, loaded with performances by world-class circus performers in addition to the food, drink and party atmosphere the party is already known for. Chillounge recently debuted the performance in St. Petersburg, and Scheer says words fail to describe the show. Sarasota, FL, December 18, 2014, Chillounge Night, the producer of the ultimate outdoor lounge party has teamed up with The Circus Arts Conservatory and Nock Productions to bring Cirque du Chill – an epic and dynamic circus arts presentation to The Marie Selby Botanical Gardens on Saturday evening, March 28, 2015. Cirque du Chill will feature spectacular entertainment by world-renowned circus artists that will be unlike any past Chillounge Night experience. The evening will be full of surprises as guests engage in breath-taking performances that only the circus arts can provide. Each stunning performance will be captured live and broadcast onto two state of the art LED Wall”s using HD Video Streaming and making the performances come alive no matter where you are at this spectacular event. LED Pro Services and VPN Studios will be providing the cutting edge technology to make it all possible. The magnificent Marie Selby Botanical Gardens will be the backdrop for the ultimate outdoor lounge party as well as the benefiting charity for this event, Hundreds of chic daybeds, cabanas and outdoor furnishings will transform Selby Gardens into an intimate and majestic setting for thousands to enjoy a festive evening of food, drink and entertainment. The Cirque du Chill concept was first introduced in November of this year in St. Petersburg to a fabulous reception. To get a taste of what to expect, see the highlights in the St. Petersburg event trailer at www.chilloungenight.com. Admission to the elegant outdoor lounge party will be $25 per person in advance for General Admission and $40 at the door (must be 21 or older). Advance tickets will go on sale January 10, 2015, and will be available at www.chilloungenight.com. A limited number of VIP tickets, which include complimentary food, beverages and valet parking on site will be available. The VIP Lounge is an exclusive roped-off section, and tickets are available for $120. Get your tickets (VIP or General Admission) before they sell out! Cafe L’Europe will provide al fresco dining in the VIP area and offering signature items and will offer wonderful items for sell as well in the general admission area throughout the evening. This year’s event offers a number of new reserved seating options. All ticket options will be available January 10, 2015 and will be able to be seen online. 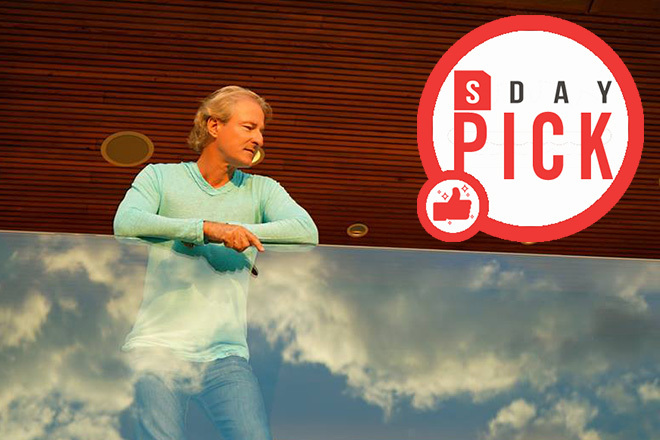 Sarasota resident and former gallery owner Rainer Scheer is the creator of the upscale event. Since its creation in 2008, Chillounge Night has expanded to additional cities throughout Florida including Tampa, Sarasota, St Petersburg, Delray Beach and Orlando. Chillounge Night – licensed to chill! Cirque Du Chill — Experience the circus you never did before! 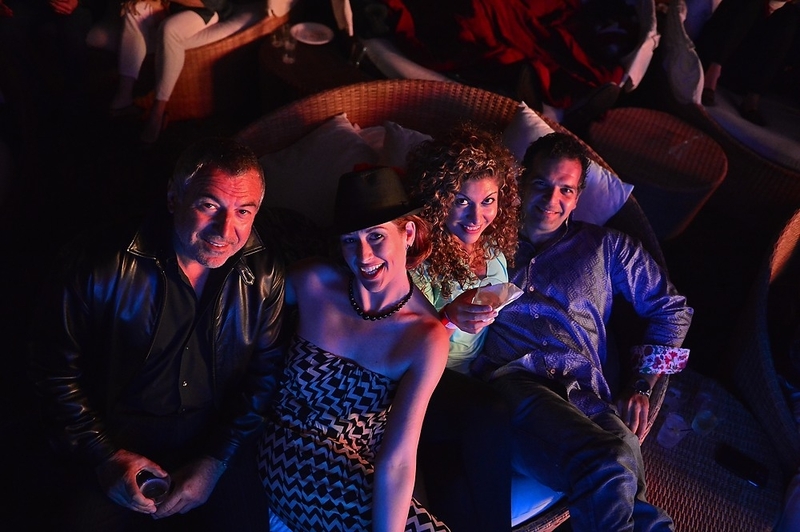 Chillounge Night – the signature South Beach outdoor Party! Chillounge Night – the coolest outdoor lounge party! Acrobats soaring overhead on 60-foot-tall poles also will be featured at Cirque du Chill, organized by Rainer Scheer, a former Sarasota gallery owner. Rainer Scheer’s next event may actually upstage his furniture. 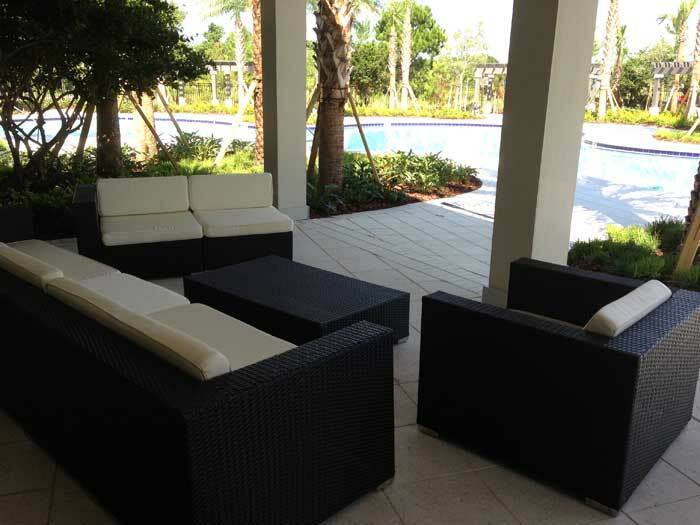 Scheer, the former Sarasota gallery owner who began staging events under the Chillounge banner in 2008, owns an extraordinary collection of outdoor furniture. Stylish and comfortable, it is one of the major attractions of his Chillounge events, upscale outdoor parties featuring food, drink and live entertainment. 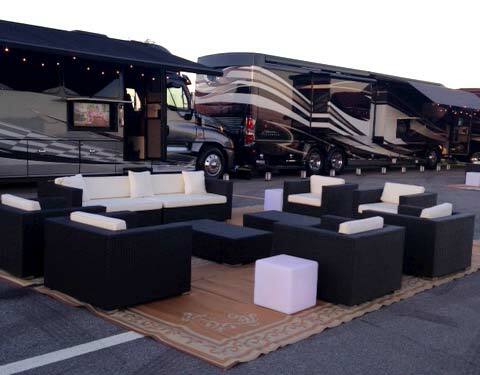 Scheer’s couches, chairs and daybeds are set up to create mobile social spaces in which attendees can relax, mingle, socialize and, well, chill. Saturday night’s event, however, should have guests marveling at something other than Scheer’s design sense. Billed as Cirque du Chill, the festivities will be the result of Scheer’s collaboration with Sarasota’s Circus Arts Conservatory. The evening will feature Cirque du Soleil-style whimsy and feats of derring-do, including acrobats performing on poles 60 feet high, as well as beneath a helium balloon floating over Straub Park. And while the crowd oohs, aahs and enjoys the spectacle, Scheer will be going a mile a minute, making sure Chillounge remains chill. Cirque du Chill will be the biggest Chillounge event yet. With Chillounge, though, Scheer isn’t known for thinking small. Scheer conceived the idea in 2008 while he was operating an art gallery in Sarasota. The struggling economy was taking its toll, and Scheer began pondering a new endeavor. One day, he said, he got tired of “waiting for people to come in” to the gallery and decided to do something “to bring back people into the downtown area of Sarasota. Indonesia, he explained, had the furniture he wanted at a price far more affordable than anywhere closer to home. The first Chillounge was in February 2008. Scheer staged his second Chillounge in November of that year in St. Petersburg. Both are now annual events in their seventh year. Since then, Scheer has staged Chillounge nights in Tampa, Fort Myers, Delray Beach, Orlando and Treasure Island. Chillounge places the club experience under the stars. Patrons set their own agenda: dance, dine, drink, mingle or relax as the mood strikes. Somewhat amazingly, Scheer has never had a Chillounge rained out, although one Orlando event had to be postponed because “it was so freaking cold,” Scheer said. While the event screams upscale, with its luxury item sponsors, the admission price of $25 makes it accessible to the more budget-minded. So will the next Chillounge have to top Cirque du Chill? Scheer isn’t concerned about that, at least not yet. “I have to take this to the next city,” Scheer said. “I have to take it on the road. “My dream is to make this the outdoor lounge party,” Scheer said. “I hope one day I can go nationwide. In addition to the circus-themed activities, Cirque du Chillounge will feature live music from Kafkasso, the Shawn Brown Band and Mikel Soulhop; a runway fashion show organized and presented by Dona Crowley with Luxe Fashion Group; a fireworks display; and nonstop music from DJ Fresh. By now you’ve probably seen the gorgeous elephants in Straub Park. Their names are Snowflake and Nero. 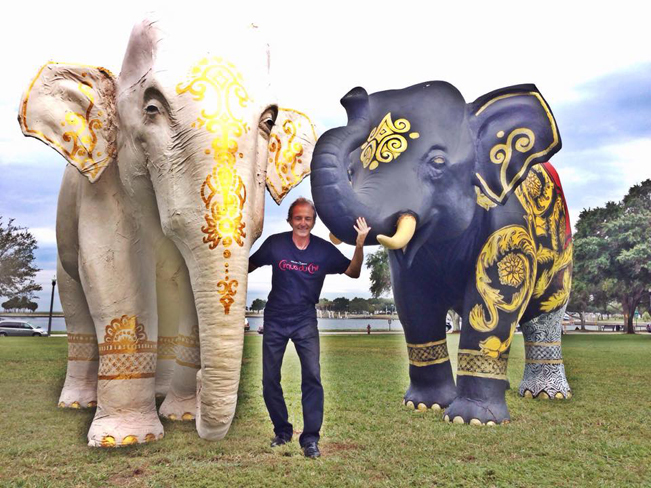 They were carved in 2012 by Kumpa Tawornprom for a festival in Sarasota. The pair have traveled to the Burg to experience the premiere outdoor lounge party in Tampa Bay. They will be featured pieces during the Chillounge Event happening this Saturday. What can you expect? Aside from the enigmatic Circus presentation, the event will feature a fashion show, fireworks, live performances by Kafkasso, Mikel Soulhop and the Shawn Brown band. The mis en scene will feature aerialists, a contortionist bending herself beyond belief, a hypnotic juggler, a daredevil and a crew of hand balancers. Luxe Fashion Group will provide an exhibition of high-fashion and elegant accessorizing as well. A few rather wild art pieces may even find a temporary home in the park after the party ends. 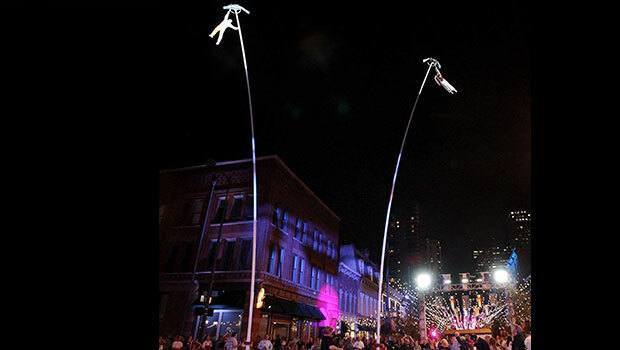 The spectacle will feature 60 ft. high towering sway poles which are the highest acrobatic masts currently available. The Wheel of Thrill will be at the epicenter of the event. Joseph Dominic Bauer will walk and run inside and outside of a wheel that rotates 360 degrees on a beam in the sky. While performing this physical triumph, Bauer will juggle torches and even attempt the act while blindfolded. Chillounge Night pulls out all the stops with a 21-ft diameter helium Aerosphere balloon that will rise from behind the event’s main stage. An aerial performer will be latched on performing underneath the balloon that takes nearly 5 hours to fill up! This is extravagance for two worthy organizations. Chillounge benefits both Creative Clay and The Woodson Museum. The event begins at 6pm on Saturday, November 22, and goes until 11pm. In case you’re concerned about the Florida freeze afflicting your good time at the event, the cold front will dissipate toward the end of the week. Saturday is projected to be a brisk and comfortable 78 degrees. Tickets to the event are $25 for general admission and $100 for VIP. North Straub Park 400 Bayshore Dr NE. We want to spread the love and send a few lucky winners to Chillounge Night! That’s why we are giving away 2 pairs of tickets to the event. All you have to do is answer the trivia question below. A winner will be chosen at random on Thursday. This is event marks the 7th Annual Bert Smith Chillounge Night in St. Pete.